This week I read the book Teach Like a Pirate by Dave Burgess. So, I know it was a great book because it got me thinking and has KEPT me thinking! Today, as I was following one of my passions (puttering around aimlessly among the living things in my yard) I was really thinking about what I had read and how it relates to my teaching. As I was doing all this thinking I noticed there were some very FAT wild blackberries growing next to my compost bin. These are here every summer and I usually pick a few, but since I was away last week it was like they just suddenly had exploded! I went inside and grabbed a bowl and set out to picking them. As I was picking that area clean, I looked up and saw on the other side of the compost bin, pinned between a white pine and a fence were some of the fattest, blackest, juiciest berries I have ever seen! I REALLY wanted those berries! But there was no way I could reach them. My arms weren’t long enough. The compost was kind of stinky and buggy. There were too many picky berry canes and pine branches. But I decided the berries were mine and I was going to find a way to have them! So, I found a long board and made a platform on the compost bin. I stood on it, the plastic bin buckling a bit. I was picturing my conversation with the emergency room staff. As I was picking those berries I saw a few more just a little bit out of my reach. Suddenly they looked like the BEST berries! I wanted them. 1. 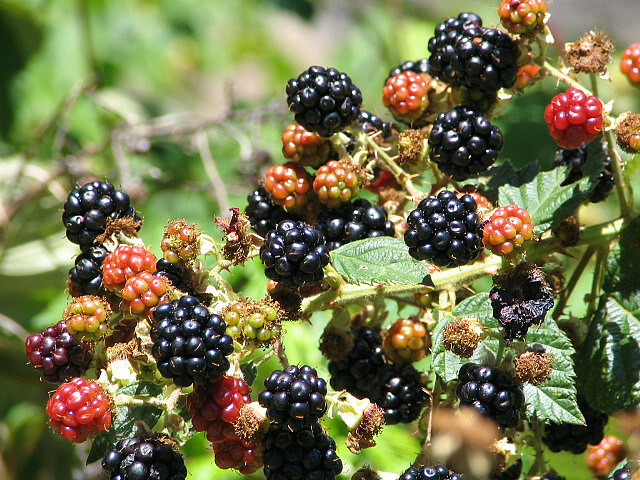 If someone had told me to go out and pick blackberries I probably would have balked at it. But I saw them and I wanted them. I liked the idea that I could get something amazing from my OWN yard. I could have just gone to the grocery store and picked up some adequate berries. But I was motivated because it was something I had decided for myself was important. 3. When you really want something, sometimes you have to work at it. I had to improvise a bit today with those berries. I got scratched, got some mosquito bites, and squished a few with poor picking technique. I attempted to injure myself by climbing into a precarious spot, I realized going THROUGH the pines wouldn’t work and had to turn around, and I ultimately did end up trespassing a little. But in the end, I got really satisfying results! It was work but worth it! 4. Sometimes the best opportunities are in unexpected places. My compost bin is pretty gross on any given day. I am not at all good about turning it or putting any kind of thought into the ratios of the types of items going into it. It sometimes smells, and usually has a fair amount of flies and mosquitoes around it. But the best berries weren’t in the sunny open spots, or along the fence row dividing my yard from the corn field. The best berries of all were in a really gross place. Don’t be afraid to be a little edgy to get to the juiciest learning. This year in my class we did a Harlem Shake (and I was asked nicely to remove it from the internet by my boss), we had swordfights in class, we learned about living in a municipal garbage dump, studied dancing Mexican cowboys with outrageously long pointy boots, and we had an entire unit based on the supernatural. I had a kid whose job it was to yell out “Qué asco!” (How disgusting!) at any moment he deemed appropriate. I had a girl who was a self-appointed queen who wore a crown, and sat on a throne made of five chairs stacked together. At first glance some of this stuff might seem a little weird, but I guarantee you the kids will remember that stuff. Don’t be afraid of the compost bin. 5. Tomorrow there will be more opportunities. Not every day is a great day. In fact most days are just ok. Mostly pleasant and enjoyable but not shout from the rooftops amazing. I get a fresh chance the next day to go in and facilitate some learning. And tomorrow afternoon there will be more fresh ripe juicy berries for me to collect! 6. Excuses are just excuses. You can find away around problems. There were a LOT of reasons to just forget about the stupid berries. Namely my health and safety! But I’m fine! And I have a nice quart of blackberries to show for my efforts! Dave Burgess talked about the “6 words.” (Buy the book and find out what they are!) When I am presenting workshops, I hear a lot of people make similar excuses for why they can’t use TPRS in their world language classes (usually in a private conversation at lunch, or during a break). I hear “I don’t have the personality to pull this off.” or “I don’t think my students would get into this.” or “This just seems like it would get tiring.” You know what is tiring? Teaching for 35 years and not enjoying your job! You don’t know if you can do something until you try, and doing something awesome OK is better than doing something mediocre really well, right? So, please, get yourself a delicious snack (I recommend blackberries), read Teach Like a Pirate, and start getting your mojo ready for the upcoming school year! This is a great post! Thanks for sharing. I needed it, thanks again! I am reading another great book, ‘Free to Learn’ by Peter Gray. It has a similar thread and has had me thinking about education (and child rearing) ever since I picked it up. …”How did we come to the conclusion that the best way to educate students is to force them into a setting where they are bored, unhappy and anxious?” It’s a must-read for educators, administrators and parents!